JERUSALEM — President Trump began a two-day visit to Israel and the West Bank on Monday, wading into a generations-old Middle East standoff that will pose an early test of whether his business deal-making skills can translate to the high-wire world of international diplomacy. Mr. Trump arrived on what was believed to be the first open, direct flight to Israel from Saudi Arabia, which do not have diplomatic relations, and said he had “found new reasons for hope” for peace during his meetings with Muslim leaders in the Saudi capital of Riyadh over the weekend. No previous American president has come to Israel this early in his tenure. Bill Clinton visited in his second year in office and Jimmy Carter in his third, while Richard M. Nixon, George W. Bush and Barack Obama all waited until their second terms to make the trip. American flags flew in Jerusalem, and Jewish and Christian holy sites prepared to host Mr. Trump, his wife, his daughter and his son-in-law. But there were clashes in the West Bank as Mr. Trump arrived. More than 1,000 Palestinians marched to the Qalandiya checkpoint from Ramallah, carrying posters of Palestinian prisoners on hunger strike in Israeli prisons. Some carried pictures of Mr. Trump’s face with a red shoe print that read, in Arabic: “American policies are a footprint of shame on humanity’s forehead. Trump’s visit is a sale of disillusionment and a station to bypass Palestinian rights. When the demonstration reached the checkpoint, Israeli soldiers began firing tear-gas canisters, rubber bullets and live ammunition and about 50 Palestinian youths clashed with the soldiers. Secretary of State Rex W. Tillerson told reporters aboard Air Force One that he saw an opening to succeed where multiple presidents have failed. 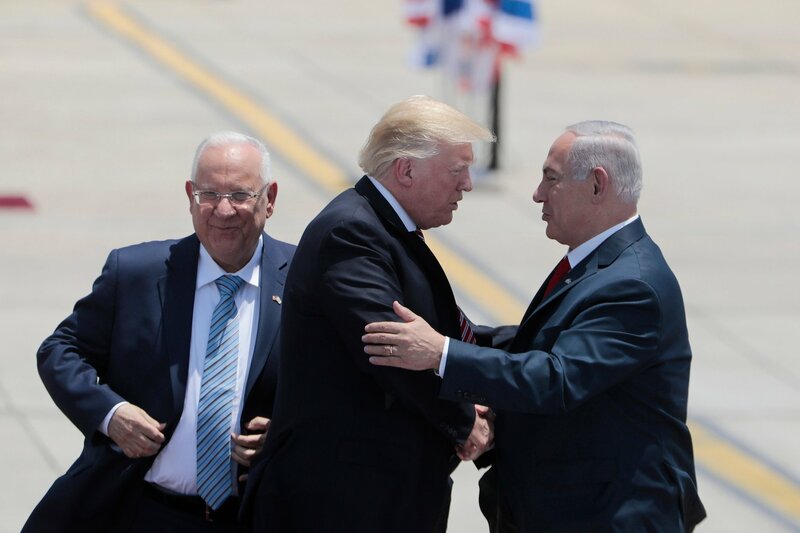 But a visit that was once anticipated as a powerful expression of solidarity between two like-minded leaders, Mr. Trump and Mr. Netanyahu, has become more complicated amid a series of logistical and political stress points. Although Mr. Trump presented himself during last year’s campaign as the staunchest ally Israel could hope for in the White House, since taking office, he has backed away from some of his promises and adopted an approach closer to that of his predecessors. Israelis had expected the United States to have announced by now plans to move its embassy to Jerusalem from Tel Aviv, as Mr. Trump had vowed to do “quickly.” But the American president has postponed that promise because of fears that it could provoke a backlash among Palestinians and their Arab allies, complicating peace negotiations. Mr. Trump’s full-throated defense of Israeli settlements has also evolved into a request that Mr. Netanyahu delay new projects. The days leading up to Mr. Trump’s arrival underscored the potential for friction. Mr. Trump disclosed to Russia’s foreign minister and its ambassador to Washington last week sensitive information about an Islamic State plot that had originally come from Israel, potentially jeopardizing the Israeli intelligence source. 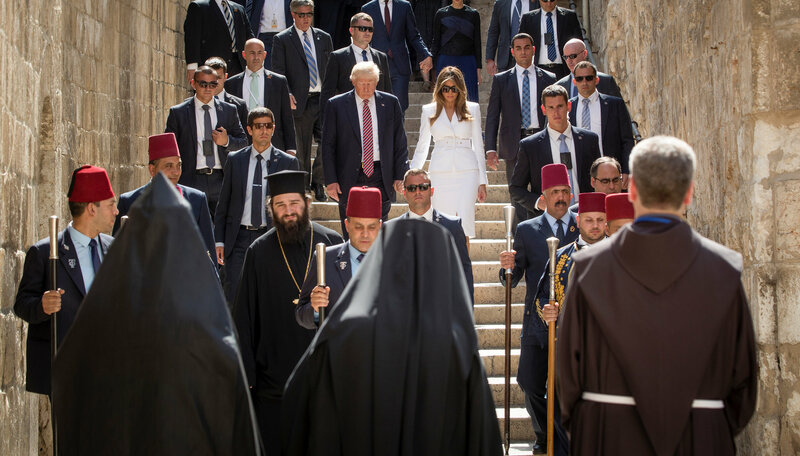 American officials also declined to invite Mr. Netanyahu to accompany Mr. Trump to the Western Wall and would not say that the sacred site was part of Israel, actions that made many Israelis bristle. A visit to the ancient desert fortress of Masada was canceled over the question of whether a helicopter could land at the top of the site, and Mr. Trump’s team wanted only a brief stop at Yad Vashem, the Holocaust museum, which offended some Israelis. The $110 billion in arms sales that Mr. Trump announced in Saudi Arabia before arriving was also a source of concern. Mr. Netanyahu had to order cabinet ministers to go to the arrival ceremony at the airport, after some had said they would not attend. Some Israeli officials said their main hope for the visit was to make sure that there was no great gaffe or misunderstanding. Despite all that, much as he was Saudi Arabia, Mr. Trump is viewed by many in Israel as a welcome change from Mr. Obama, whose relationship with Mr. Netanyahu soured early on, after Mr. Obama called for a settlement freeze, and only worsened from there. Mr. Obama’s support for an agreement intended to curb Iran’snuclear program was also seen by many in Israel as a fundamentally bad deal, a view that Mr. Trump says he shares. 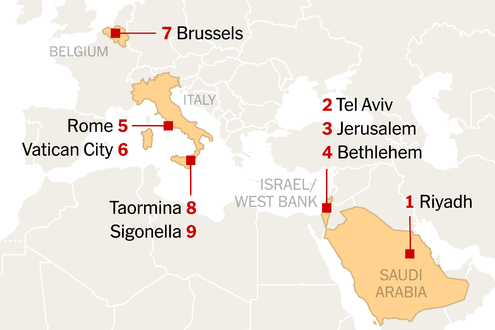 One of the primary goals of Mr. Trump’s trip was to solidify the emerging alignment between Israel and Sunni Arab states against the Shiite-led Iran. He sees a peace agreement as part of that effort, and hopes to use an “outside-in” strategy of enlisting Arab neighbors to help resolve the long-running dispute between Israelis and Palestinians. 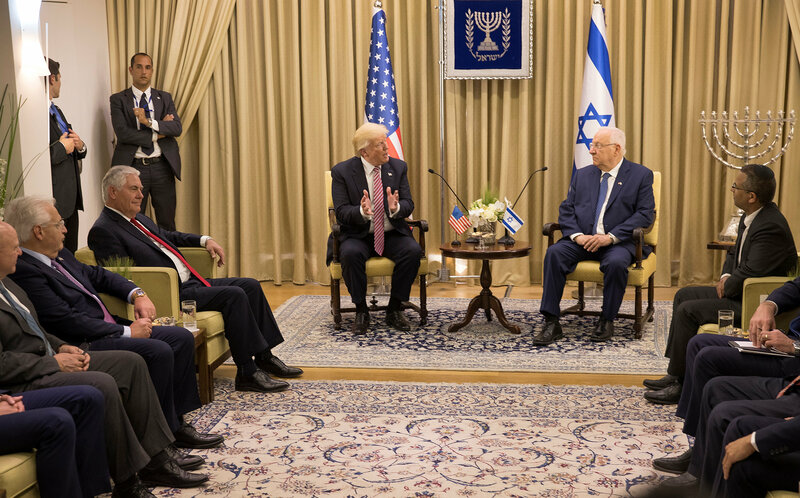 After a meeting with President Reuven Rivlin, Mr. Trump suggested that Arab states like Saudi Arabia were readier to make peace with Israel because of their shared antipathy for Iran. “There is a growing realization among your Arab neighbors that they have common cause with you in the threat posed by Iran, and it is indeed a threat, there’s no question about that,” he said. 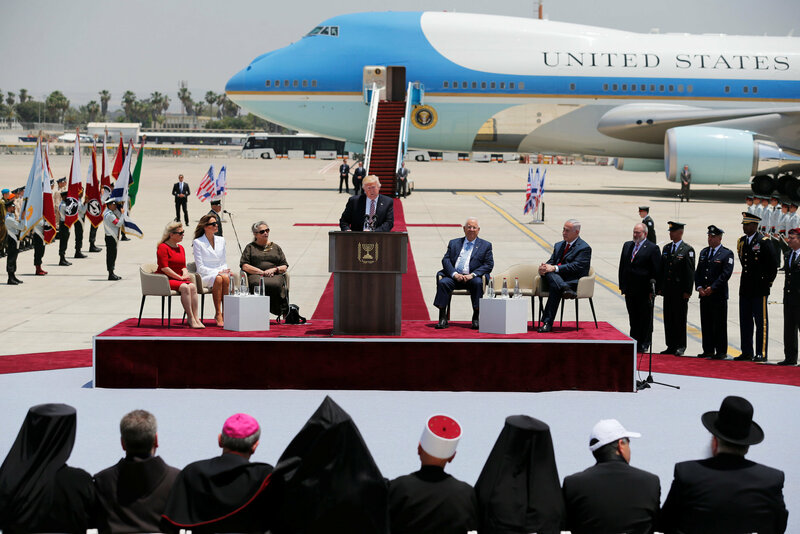 Mr. Trump arrived just a couple of weeks shy of the 50th anniversary of the Arab-Israeli war of 1967 when, among other territorial gains, Israel annexed East Jerusalem and occupied the West Bank, as it does to this day.